The Deep Run Mennonite Church East (Mennonite Church USA), one of the oldest Mennonite congregations in Bucks County, Pennsylvania, is located in Perkasie and is affiliated with the Franconia Mennonite Conference. 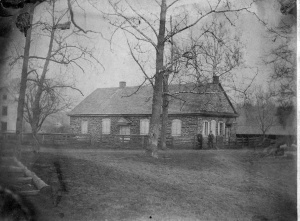 The original log building erected in 1746 was also used as a school until it was razed in 1842. One of the preachers, Samuel Godshalk, was an influential teacher and music instructor in this school. Deep Run has ever since had a strong group of choristers who have left their impress upon congregational singing. Later meetinghouses were erected at the same location in 1842, 1872 and 1949. The first preacher and bishop at Deep Run was Abraham Swartz, who served over 50 years. Deep Run, being the oldest of the circuit of three Bucks County congregations, was always the meeting place for the small conference (Kleine Rath) held each spring before the regular conference (Grosse Rath) held at Franconia. It has the distinction of being the only Mennonite Church in the Franconia Conference holding services every Sunday as early as 1847. Sunday school was not organized until 1904. The German language was continued in services, although English had been introduced much earlier, until the death of John Leatherman in 1925. The Oberholtzer schism of 1847 took some 50 or 60 members, who organized a congregation today known as Deep Run West Mennonite Church, and built a meeting house only a short distance from the old meeting house. In 1927 several members joined an independent group. Though in its earlier history the congregation suffered because of its slowness to change, more recently its leadership has encouraged youth and extension activities. The membership in 2016 was 317. Rice, Timothy. Deep Run Mennonite Church East: A 250 Year Pilgrimage, 1746-1996. Perkasie, Pa.: The Church, 1996. Available in full electronic text at http://www.deepruneast.org/a-250-year-pilgrimage.html. Wenger, John, Christian. History of the Mennonites of the Franconia Conference. Scottdale, PA: Mennonite Publishing House, 1938. Abram W. Yothers (1903-1994) 1934-1970s? Erwin K. Nace (1900-1988) 1941-1970s? Leatherman, Quintus. "Deep Run Mennonite Church East (Perkasie, Pennsylvania, USA)." Global Anabaptist Mennonite Encyclopedia Online. 1956. Web. 25 Apr 2019. http://gameo.org/index.php?title=Deep_Run_Mennonite_Church_East_(Perkasie,_Pennsylvania,_USA)&oldid=139983. Leatherman, Quintus. (1956). Deep Run Mennonite Church East (Perkasie, Pennsylvania, USA). Global Anabaptist Mennonite Encyclopedia Online. Retrieved 25 April 2019, from http://gameo.org/index.php?title=Deep_Run_Mennonite_Church_East_(Perkasie,_Pennsylvania,_USA)&oldid=139983. Adapted by permission of Herald Press, Harrisonburg, Virginia, from Mennonite Encyclopedia, Vol. 2, pp. 25-26. All rights reserved.